The blending of the ancient and the modern is a preoccupation of her novels on many levels, and comes through in the way she addresses gender. As Donna Jones, Professor of English at UC Berkeley pointed out in their conversation following the reading, many of Okorafor’s stories feature strong female protagonists who make deliberate choices about aspects of their heritage that are harmful to them, or that they feel ambiguous about. 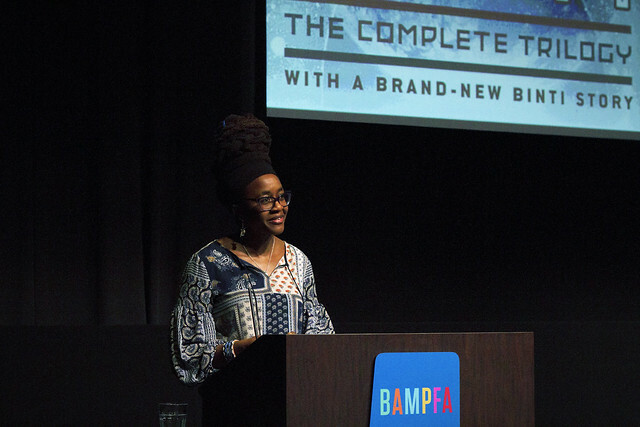 Okorafor acknowledged that as much inspiration as she took from traditional culture, she was also keenly interested in the ways in which traditions reproduce oppression. “The patriarchy is something I’ve been pushing back against for a long time,” she said.